I went by the reopened Carytown store and the Martin’s logo was up–perhaps the worst red you’ve ever seen. Blood-curdling, want to kill people red. It’s bad. It’s garish. It’s just plain icky. Not a good color. The food inside will likely be fine, but seeing such a lame logo–just bad 70’s design almost made me want to go to Food Lion or Wal-mart. 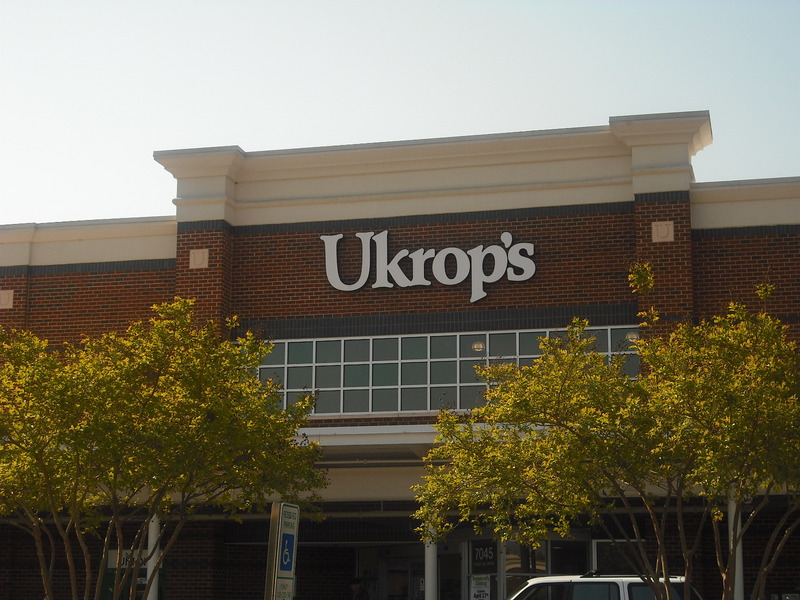 My Forest Hill Ukrop’s memory isn’t even about that store–that’s how little we connected. When I moved to Richmond from South Carolina a million years ago, I had to rush up to our little cute empty house on Pinebrook Drive with my one year-old daughter to beat the movers who had changed their plans suddenly. Deirdre and I arrived at the house, one of us more exhausted than the other and one of us needing to use the bathroom more than the other. Remember only one of us was in diapers. Put the key in the kitchen door and it wouldn’t work, wouldn’t come out. Completely stuck. I was panic-stricken for all sorts of reasons. How were the movers going to get in the house if I couldn’t? How was I going to be able to clean the house ahead of the movers since the floor refinishing people had been there? Where were Deirdre and I going to sleep? Where was I going to pee? After about ten minutes of this nonsense, cussing and sweating and on the verge of tears–gotta get the water out one way or the other– I was about to give up, leave the key in the door and go to–where else–Ukrop’s, when the key miraculously worked. All was well. We looked over the house and got back in the car to go to the old tiny, humble Chippenham Ukrop’s–the precursor of the Forest Hill one– to pick up some food and milk and cleaning supplies. No doubt chocolate was involved. It was my first actual shopping trip in a Ukrop’s and though I can’t say it was love at first sight; it was right at first sight. Remember I had been living in the land of Piggly Wiggly, so I had come a long way in one day. My brother, Dave, got his first job at a Ukrops as a bag boy. Before his interview, he got a “Ukrop haircut”. I have an uncle that visits from Charlotte every Christmas…we always get him his own Ukrop’s Chocolate Fudge Pie. A few years ago, both my babies had the flu and I was starting to have symptoms, too. I went to the Ukrops Pharmacy to pick up their Rx and realized I had forgotten my wallet. One look at me must have told them I wouldn’t make the trip back anytime soon and they gave me the meds for an IOU. It is a very sad good-bye. I went by Carytown too….went inside even. I bought some food there, some beer, decent steak, and perfect strawberries all in one place. It wasn’t so bad.